The Perfect Book. Wait. OMG. There are Errors? Sometimes, no, let’s make that most of the time, writing and publishing can be frustrating. Just about the time you think you have things right, something happens. But more on that in a moment. 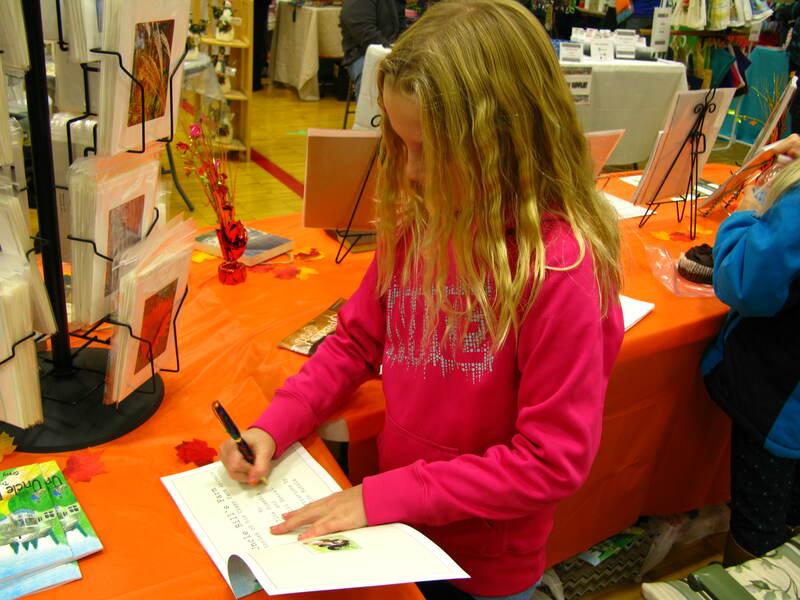 Alli’s and my first booksigning event for “Uncle Bill’s Farm” is in the record books. 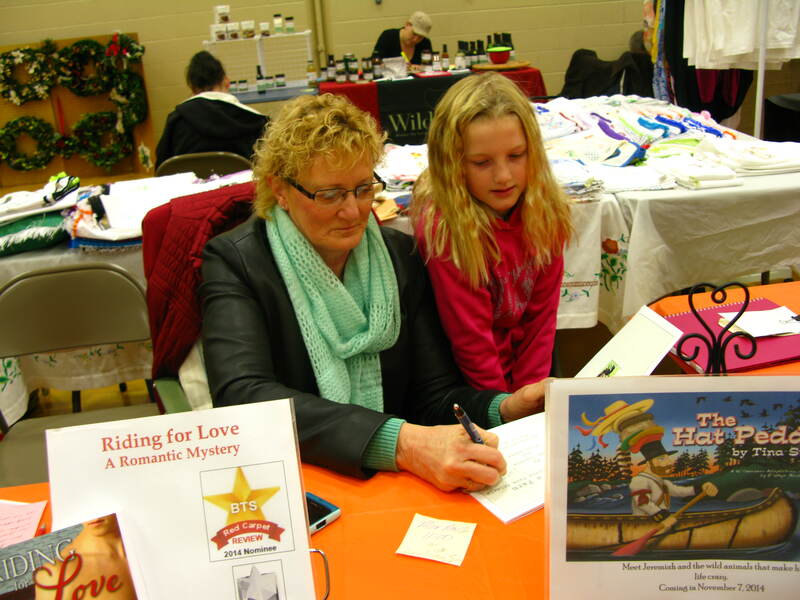 I loved telling people who stopped at our table that I wrote the book with my granddaughter. Getting Alli to talk was another thing. She can be shy, and when she did say something, it was hard to hear her. One of things I had her do was sign the seventy-eight books I had with me. Then, of course, she made me sign them, too. I didn’t have the heart to tell her I’d sign them as they were bought. I did let her use my special pen a friend gave to me for signing books. But, it turns out all that signing was for naught. Last week I picked up the proof for “Uncle Bill’s Farm.” Everything looked good except for a few borders the printer had to fix. I gave the go ahead for printing, and Friday I picked up the books. Because of all the political flyers and things Jim had to get done, he only had time to print seventy-eight books. Thank goodness for that. Saturday morning came. I got all set up at the kids’ school and waited for my co-author. Alli and her friend came in, and the first thing they said was, “We found a mistake.” My stomach dropped. I felt ill. If there is one thing I can’t stand is having an error in one of my books. The mistake was on a page that I changed the wording. I used the words “the chickens” twice in one paragraph, decided to remove one and substitute the word “they.” I forgot to remove the word “the,” so the sentence had “the they” side-by-side. I was devastated, but Jim (the printer) said it was an easy fix. Then last night my daughter called me to tell me she found three errors. OMG!!!!!!!!!!!! One was one I knew I had fixed before the proof printing, one was the mentioned above and one was one nobody had found—except Becca. I tossed and turned all night worrying about how the one error had shown up in the printed books, but wasn’t in the proof. How were we going to fix the others? What would people think when they saw the mistakes? 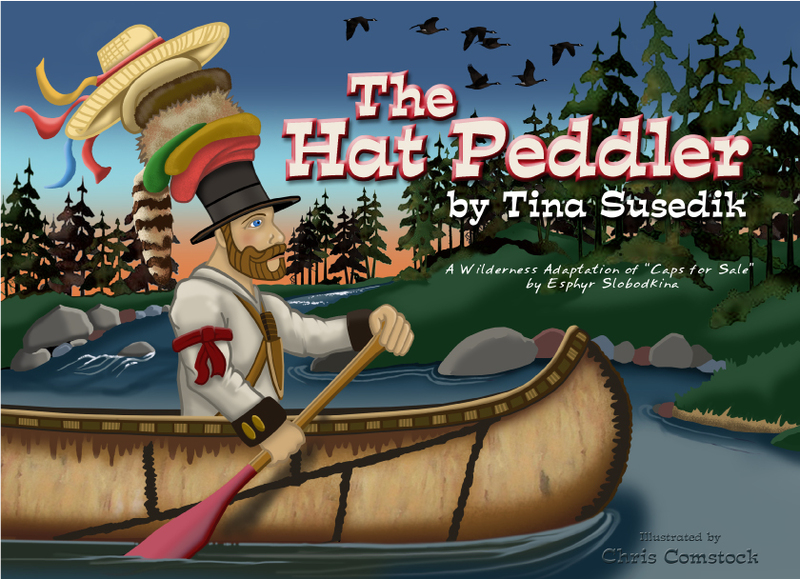 This morning I had to send the printer the file for “The Hat Peddler,” via an on-line transfer site. I couldn’t get the darn thing to work. I was still obsessing about the errors in the other book and worrying “The Hat Peddler” wasn’t perfect. The night before I read the text frontward and backward—twice. Then I found the proof to “Uncle Bill’s Farm,” and low and behold, the first mistake was correct on the proof. Since I couldn’t send Jim the file, I drove thirty miles to his office with proof and new book in hand. Neither one of us could figure out what happened, but we think he may have printed from the wrong file. I believe there is a reason for everything. Since he hadn’t bound any of the additional books, yet, I was able to make the corrections, and give him a new file. He’s printing the three new pages and inserting them in the book before cutting and binding. Yay. “Uncle Bill’s Farm” should now be error free. I have a good idea on who bought the book over the past few days. They are all going to get the new version. Friday I pick up the new books along with “The Hat Peddler.” Now all I have to do is get rid of that nagging knot in my stomach, get Alli to sign books again, and get some sleep. Time to get caught up with the world. The last month has been a busy one – but what else is new. 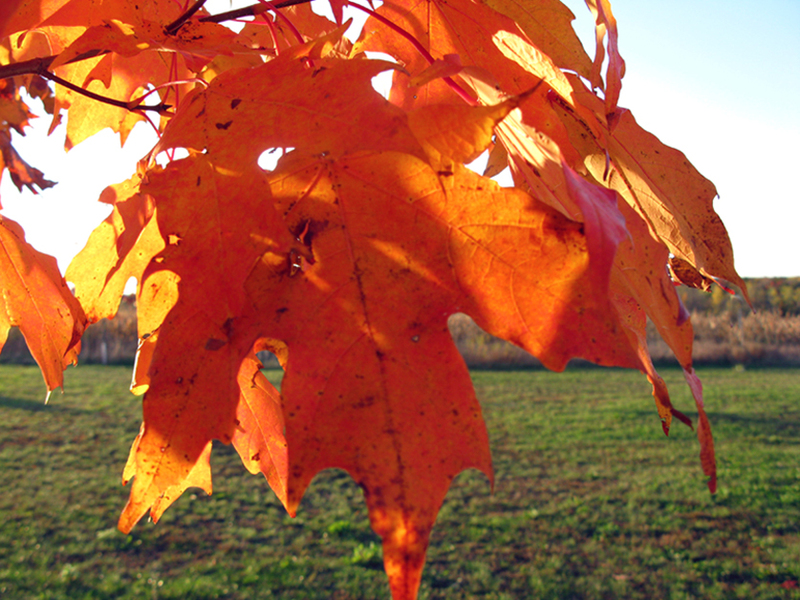 I made time to enjoy the beautiful fall colors, though. 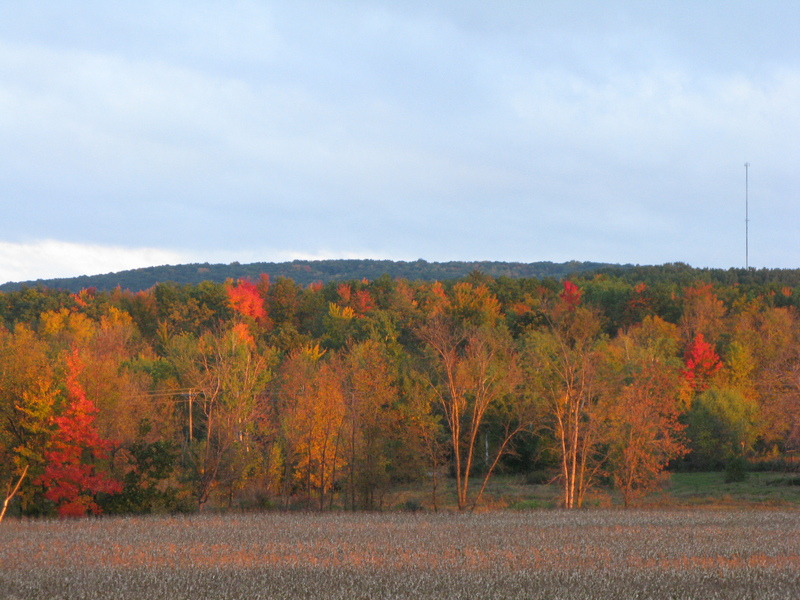 Right now peak is over and with the wind and rain, there won’t be many leaves left on the trees. I keep hearing this winter is going to be a rough one again. I just close my ears and enjoy the fall. The past month has included: my solo camping/writing weekend, vacation (camping) with my husband, finishing edits for my short story for Soul Mate Publishing, “The Proposal;” running (or trying to run) my first 5K that a storm ruined;, judging a writing contest; working on a new website with the help of my daughter-in-law; learning more about Pinterest, Twitter and Facebook; entering some of my photos in a contest; participating in several booksignings; finishing first-round edits for another romance; sitting for my grandkids; trying to clean up outdoor summer stuff; making a Hallowween costume for a granddaughter; trying to set up interviews with unpublished writers for this blog; and the daily junk everyone does to do to live. The one thing I didn’t do was blog each week. 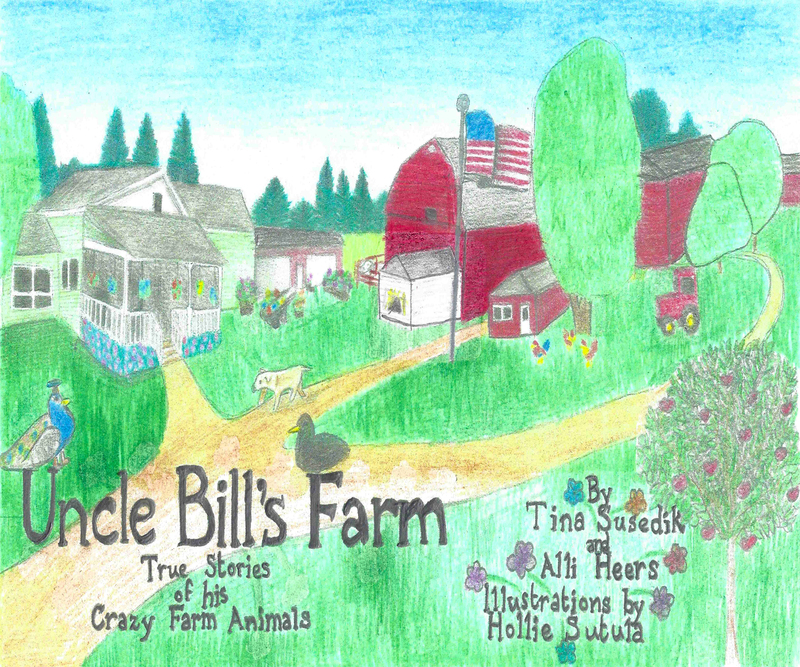 The biggest accomplishment was finishing “Uncle Bill’s Farm,” a children’s book written by my granddaughter, Alli and myself. 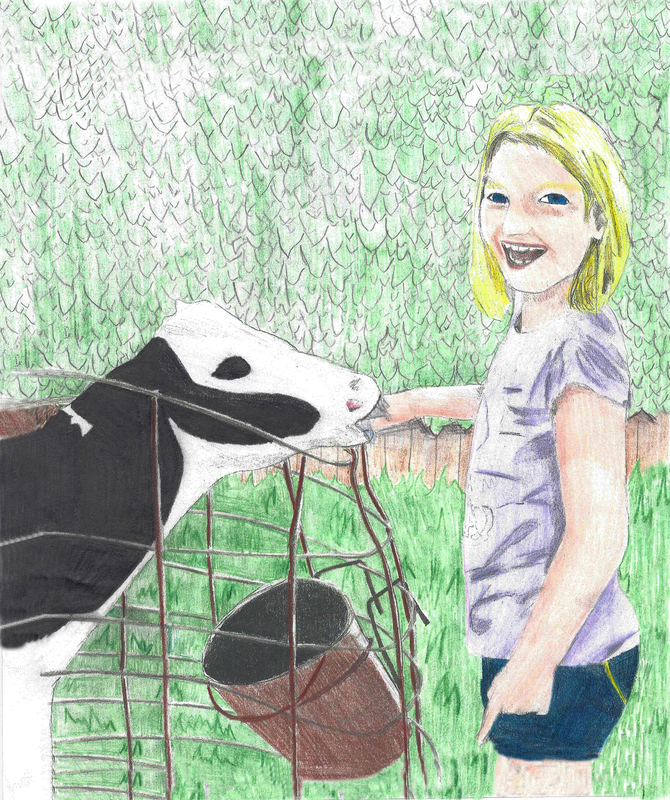 “Uncle Bill’s Farm” is a story told from the perspective of Alli and her visits to my brother and his wife, Bill and Patti Peters and their farm. For years he told us stories about how crazy his animals are, many acting more like humans than animals. For example: a duck that takes care of kittens, a peacock that wants to go to town and a turkey that eats with the cats. 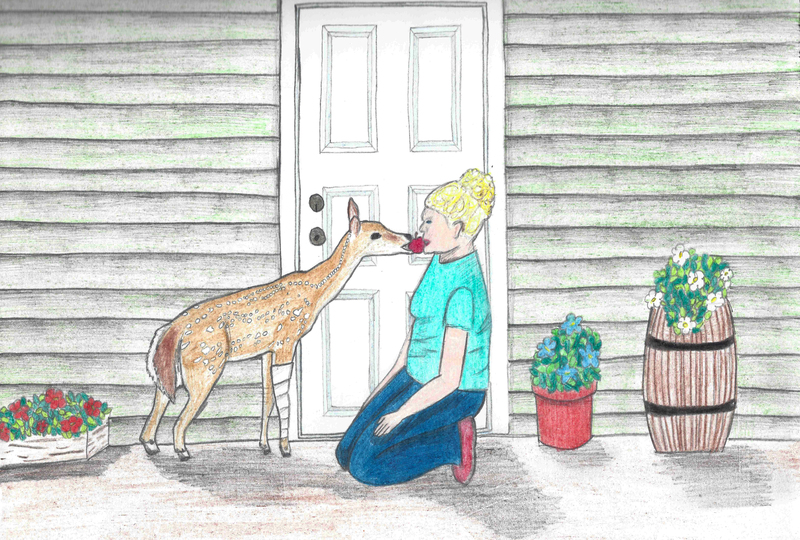 Since she was seven, Alli and I talked about putting these stories in a book. Finally, a little more than a year ago, we wrote the stories down. We’re working on a sequel, “Cassie and Peanut On Uncle Bill’s Farm” which is a true story of Bill’s dog and pig who became best friends. I had wanted the book to come out earlier than it is, but there was a little glitch with the illustrator I hired and ended up finding a new one. Turns out she was closer than I realized. One day, my niece, Hollie posted some pictures on Facebook, saying she’d drawn them. They were fantastic. I didn’t know my niece was such a talented artist. I called my sister and she had Hollie draw a picture from a photo I sent her. She was hired the next day. Many of the pictures she illustrated were taken from photos I snapped at Bill’s farm over the years. Some were created from Hollie’s imagination. For someone who’d never done anything like this before, I feel she did a wonderful job. Yesterday I placed the last picture in the book. Monday it goes to the printer. Once I get the first proof, make changes, and send it back, it will go to press. The anticipated date for release is November 1st. Last picture to be placed. Once the book is ready, I’ll put the information on how to order on my website. I’m hoping to get it on Amazon–with a little help from my friends. I’m excited and happy to FINALLY have “Uncle Bill’s Farm” done. I look forward to talking to schools and setting up booksignings. I hope you enjoy a sample of some of Hollie’s pictures. A few months ago, I revealed Jeremiah, the main character for my children’s book, “The Hat Peddler.” My illustrator just sent me the cover, and I can finally share it. I’m so excited and can’t wait to see Chris Comstock’s vision for the rest of the book. I’m hoping to have it out this October. 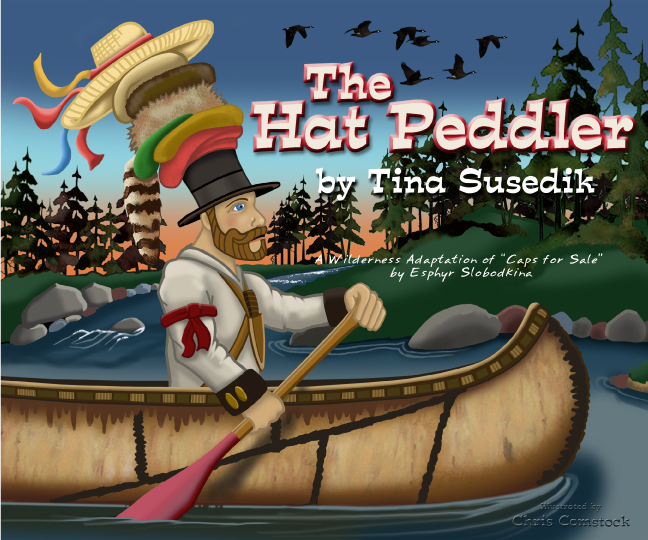 “The Hat Peddler” is a wilderness adaptation of “Caps for Sale” by Esphyr Slobodkina. In 1998, when Wisconsin had its Sesquicentennial, my husband and I participated in a voyageur adventure. At the end of a long day of canoeing, protecting our “precious goods,” portaging and other activities such as fire starting, ax throwing and shooting a black powder rifle, we all gathered around a campfire and told stories or sang songs. Al put me in charge of telling a story. “Caps for Sale” was a book I used when I taught kindergarten. For some reason the story popped in my head as we rounded a bend in the river. I adapted it for Wisconsin, but kept the monkeys. As time went on, I decided to re-create the story using wild animals from Wisconsin. Jermiah, the main character, was heading down the Fox River to the Wisconsin River on his way to Prairie du Chien for the spring rendevous. Instead of monkeys, along the way, he encounters many problems with the deer, skunks, coyotes and raccoons, just to name a few. I am so excited to share my illustrator’s concept for my new children’s book. 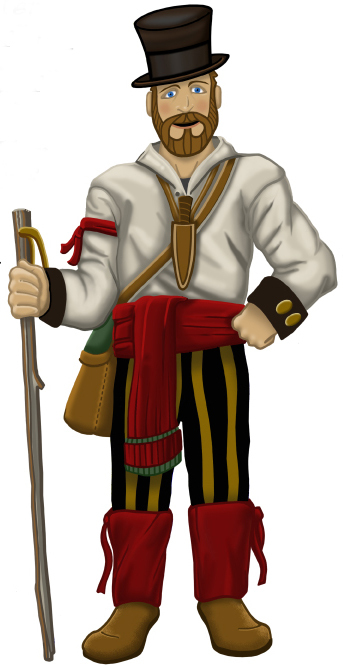 Jeremiah is the main character (actually the only character) in The Hat Peddler, a Wisconsin Voyageur book coming out later this year. To me, Jeremiah looks friendly and smart, with just enough silliness to get him into trouble on his voyage from Green Bay to Prairie Du Chien. I can’t wait to see more of Chris’ talent put together with my words.